1. What strategies are available to protect the health of those who are addicted to tobacco and nicotine and who are either unable or unwilling to quit smoking? If the only possible answers are ‘smoking cessation’ or ‘complete abstinence’, then many older, often poorer smokers will continue to smoke and we know that half of those will eventually die prematurely as result. Certain groups will be severely disadvantaged: for example, those with mental illness where smoking prevalence is very high and nicotine has therapeutic effects. A crude ‘quit or die’ philosophy should have no place in a WHO health treaty. Strategies for dealing with nicotine addiction must take account of real people and real-world behaviour, and use any possible strategy to reduce the harm caused by tobacco, even if that means using tobacco or nicotine products with greatly reduced risk as alternatives to the most harmful and dominant form – namely, cigarette smoking. 2. How should the FCTC and national legislators treat nicotine-containing products that have very low risks relative to smoking cigarettes (a few percent at most), but are viable alternatives to smoking? If these products are to be banned or over-regulated, then a very serious problem arises: why should a health treaty deny a person addicted to nicotine access to products that greatly reduce their risk of disease? There are no precedents for banning or marginalising safer alternatives to a harmful market leader (cigarettes in this case) and it is absolutely unethical to do so. The further danger of bans or excessive regulation of low risk, non-combustible nicotine sources is that they protect the cigarette market. It would be a terrible failing of the FCTC if it was unwittingly doing the dirty work of the cigarette industry. These papers share a serious weakness: they do not properly consider the role of smokeless tobacco or electronic nicotine delivery systems as credible alternatives to smoking. Therefore their potential positive health value in reducing the burden of disease associated with smoking is ignored or marginalised. In one country, Sweden, we know with certainty that the use of smokeless tobacco (‘snus’) has greatly reduced the burden of tobacco-related disease. You can read a summary of the evidence about smokeless tobacco at www.clivebates.com or a peer-reviewed academic review here. The ‘harm reduction’ case for novel nicotine delivery devices is even stronger, the risks even less, and the opportunities for public health are substantial. The briefing papers of the NGO Framework Convention Alliance on smokeless tobacco and electronic nicotine delivery systems similarly overlook value of reduced-risk products in reducing harm. I am concerned that a dangerous group-think may set in around the FCTC, which would have serious negative consequences for health if not challenged by delegations who insist on a relentless and rigorous focus on health outcomes. First do no harm – please do not agree to regulations, internationally or domestically, that deny smokers access to ways of taking nicotine with greatly reduced risk. This misguided prohibitionist agenda would be harmful to health, highly unethical and amount to support for the cigarette industry. Look beyond the two secretariat papers above – they overlook the most important issue and opportunities for considerable health benefits. Delegates should insist on a broader assessment and should request an impartial scientifically credible assessment of harm reduction strategies for the next COP or other appropriate FCTC forum. Begin to consider what form of regulation would create an ‘enabling framework’ for nicotine products that could displace cigarettes for continuing nicotine users and thereby greatly reduce the burden of disease arising from smoking. The FCTC was set up to protect health, and tobacco harm reduction is a vital and powerful health strategy. Such regulation would be designed to build confidence in these products as alternatives to cigarettes and to promote switching from smoking to non-combustible forms of nicotine delivery. I am sorry I cannot join you in Seoul, but I hope you have a productive week. If you would like a balanced, humane and rational view on tobacco harm reduction, I recommend viewing a short video by Gerry Stimson, a renowned expert in public health. Disclosure: I am writing strictly in a personal capacity and from long-standing personal commitment to the goals of the FCTC. I have no conflicting interests, in particular no financial or material links with the tobacco industry, nicotine device industry or pharmaceutical industry, or their agents. Hello, its good post regarding media print, we all be aware of media is a great source of facts. I’m very glad to have had some comments from people who actually use these products (Jonathan, nisakiman, vapacas, Mark, Elaine, Karen, Charlene, Christine, Dave, Jamie, Jade and Rursus so far). One thing almost always absent from the nicotine/tobacco policy deliberations of the WHO, EU and the civil society groups that lobby on these issues is any voice for the people they are supposedly trying to help, or much apparent concern for their views or empathy for them as people. That’s a cardinal sin in most areas of health policy (or any policy) to exclude those most directly affected, but in practice it is done intentionally in the FCTC. PS. there’s a great discussion of this on Vapour Trails TV (from 21.00 on FCTC and from 27.00 on access to the FCTC process, exclusion of the public etc). Also, some great chat comments came in from Vapour Trail TV viewers. 12 month ago, I saw an associate of mine “smoking” a e-cigarette and tried it…. and it worked!!! Never had “smoked” a “real one” since that date! I CAN breathe, smell, taste again! I´m able to run again! I´m able to reach the fourth floor, without breathlessness again! I´ve acquired so much lifequality back! The health minister of North Rhine-Westphalia -NRW- (most populous state of Germany) Ms. Barbara Steffens is up to no good since Dec 2011. First, she had outspoken a ban on electronic cigarette on a press conference on 16 December 2011 – but this ban was fortunately repealed by the Supreme Administrative Court of Münster. Now… she is in the “final round”: The state diet of NRW is up to regulate E-Cigarettes under a rewritten non-smokin law that will become effective on 1st of May. At effective date, the e-cigarette will be treated like a tobaccocigarette and therefore strictly forbidden to use in public space like pubs, restaurants, public buildings and children playgrounds under the open sky. The vapers of germany fear that this is only the beginning of a nationwide e-smoking-ban, followed by ruling the e-cig under the nationwide drug law ( once again initiated in the background by Dr. Martina Pötschke-Langer and executed by Ms. Barbara Steffens ). Instead of scaremongering, and talking about banning E-cigs, I’d say promote it instead. Every one knows smoking is bad for your health, and every one has the choice wether they want to quit or not. Most want to pack up the old cigarette, but find it too hard and end up wearing a patch whilst going outside to light up that cigarette, because the patch doesn’t stop the craving. It is not the nicotine, that’s the addictive factor for most, it’s more the other 3999 chemicals in the cigarettes that cause the addiction. That in combination with the ritual of having a break from everything, sitting down, lighting the cigarette, feeling the warm smoke entering your mouth and rolling around your tonge, has a calming/soothing effect on smokers. The E-cig gives you that soothing effect, as you have got the warm vapour entering your mouth, rolling round your tongue, but without all the harmfull ingredients, and without the danger of burning anything, nor causing second hand smoke. Isn’t harm reduction what this is all about? The government, the WHO and other organisations want to put laws/rules on people by introducing laws, telling you what you can or cant do, but missing the point, and contradicting themselves. They want you to stop smoking, but when you finally find something, after many years of trying any and every NRT out there, they want to take your last resort off you. Have you got a intensive going within the NHS just to give you good statistics? eventhough you know you failed miserably? Is it because when every one stops smoking, you wont get the tax money put on tobacco, and there for cant fill your pockets enough? One cannot deny the E-cig works. Every one I know has managed to fully quit smoking tobacco/ cigarettes , and most of them are reducing their nicotine intake. And all feel better for it. Mentally and physically, using the E-cig, as where they failed miserably on NRT’s promoted by their GP. Infact GP’s everywhere have now started to promote the E-cig. There are no harmful substances in E-cigs, no second hand smoking, so a win win situation for all. Again it’s the good ones that suffer, I just wished there would be so much commotion on alcohol, as I still see people going out in their cars after they been filling themselves up with alcohol, strolling out of the club late at night. Infact We had a drunk smashing the rear end of our car up the other day, when we rang the police, with the offenders still there, they wouldn’t even drive out to the scene of the accident, and my partner who has lung desease had to get out of his way trying to get to the police station, without his car, cause that has been smashed, not being able to walk more than 50 meters without having to have a break due to chest pains. So this tells me, that you are legally allowed to be entoxicated, kill some one else and get away with it, but vaping on an E-cig is supposed to be made in to a crime? I want to start with saying, I love tobacco. I love the smoke, the way it rolls around my tongue, or how a good cigar tastes with a brandy, or a cigarillo with a coffee. Perhaps some day in the very distant future there will be a way to smoke without the negative effects, you know…like death. But this is my story and I am sure there are many others like it online. I Started with inhaler and then chantix or whatever its called, then I used a nicotine patch (just the one) and had a bad reaction (hallucinations and vomiting) to it, that the poisons hotline said to my partner was a sign of nicotine overdosing…. Go figure..the smallest dose of a nicotine patch almost killed a heavy smoker! My aim is to one day be down to 4mg, then 2mg then 0mg then nothing. I can take it at my own pace, knowing i am in full control.I have already Reduced my nicotine consumption down from 24mg down to 12 Mg. Also Vape a 0mg menthol flavor Ecig when I want to have something in my hands. Nicotine in controlled amounts is no more dangerous than caffeine, and caffeine has killed more people (energy drink O.D’s) than have been killed by people that use Ecigs. In fact, I am yet to see a report where someone has used an ecig and been dead 24-48 hours later. With research, we may find that ecigs in fact do some damage but when you look at eliquid made in proper places, the proper use of flavoring and the safe use of nicotine and then compare it to 40000 chemicals and the smoke from combustion in Analogs, it really is a no-brainer. In some places, we take heroin users off the street and put them in injection clinics. We go from knowing that they are most likely going to die, to bringing them in somewhere safe, offering them clean needles and offering counseling. That might not sound like something to some people, but it is doing something, not just ignoring the problem and sticking it in the too hard basket. Smokers aren’t quite at the same extreme as that, but something needs to be done. We have needed our own “clinic” for some time and ecigs have been shown to be that and give the control back to the people. Now I know this sounds like it is encouraging a new generation of people addicted to nicotine, but perhaps nicotine is the new coffee, and it is certainly better than filling your lungs up with tar, or giving your children 2nd hand smoke related illnesses because you need your fix at the breakfast table…At the very least, Ecigs have the potential to take large proportions of the cigarette community out of the equation. This will save billions of dollars in medical and hospital related expenditure in the long run. This makes perfect logical sense in my mind, but its 4:40 am right now, and I haven’t had my morning vape yet! Please look at the various self funded studies out there, such as was done by Flavourart. People putting their own time and money into finding out what eicgs are, what they do and what effects they have. When we let millions of people starve in Africa when the world could solve it in an instant, When people Attempt to ban ecigs and when Men think they have the right to tell women what to do with their bodies then we really know who is in control of the world, and it ain’t people trying to do good. I support this initiative from Clive. I have spent more than 25 years studying the difficulties of quitting smoking and the contribution a range of policy-related interventions can have in contributing to the decline in countries that have enacted such policies. There is no doubt that, in combination, these have resulted in a marked decline smoking, although there is room for debate about the relative contributions of the various elements. However the decline has been and remains slow. Further over the last decrease or so, there is evidence that the progress in quitting may have declines, while success in preventing uptake has made more progress. Quitting is for many extremely difficult, with a significant minority of ever smokers going to their graves never able to quit this dependence. I have come to the conclusion, that even in the most successful countries, that we will not effectively end the epidemic of tobacco-related harm within the next generation just using the range of strategies currently being used. I believe in adopting a comprehensive range of strategies, and that this must include consideration of harm reduction strategies along with those currently used. I do not know whether these additional strategies will be enough to allow for an effective end to the epidemic, but they are the only really plausible set of strategies that have not been pursued systematically pursued yet, apart from reducing the attractiveness of existing cigarettes, and reducing availability, both strategies likely to be more effective in the presence of harm-reduced alternatives. The death and disability toll from cigarette smoking is far too high not to be doing all that we can. The rise of a consumer movement, as I understand almost entirely consisting of ex-smokers, supporting the use of e-cigarettes is the first social-level evidence that there might now be substitutes for cigarettes that will be readily taken up by smokers. These and other strategies should be actively considered. The UK should be congratulated in their apparent leadership in this regard (if the current draft NICE proposal is adopted). More countries should follow. If tobacco control is important enough to have the FCTC, it is important enough to be taking bold steps to eliminate. We must be doing more. I have attempted to quit smoking over the years with gum, patches, a powder dissolved in water, Chantix, cold turkey, and the nicotrol inhaler. The longest anything lasted was 2 weeks. I tried an e-cigarette a family member had and thought that MAYBE I would be able to decrease the amount of damage I was doing on a daily basis by substituting the e-cig for some of my daily cigarettes. Within a month, I was no longer smoking at all. I have severe asthma, and was using a nebulizer and 2 inhalers on a daily basis. I now have a single inhaler that I have used twice (due to a cold) since I stopped smoking. I have watched 5 family members die through smoking related diseases. I’m ecstatic to say that I no longer have any desire for cigarettes, and according to my doctors, my own health has greatly improved. Had I not found e-cigs, I am absolutely certain that I would smoke until I die. The “quit or die” message was not going to save me. An opportunity to greatly reduce harm was a message received and heeded. I would like to think that any health professional would rather see someone reduce the harm than die an early death because they are unwilling or unable to practice abstinence. Wading into the swamps that need draining so as to prevent more deaths due to crocodiles, FCTC secretariat it seems instead to be calling for a ban on the sandflies, forgetting about either draining the swamps or shooting the crocodiles. This is a poor analogy of course, since crocodiles kill relatively few people. In New Zealand we have a national goal to reduce smoking to 5 percent prevalence or less by 2025. However on current evidence, using all current means of tobacco control we would not achieve this until 2050 or later. The need is now accepted that the sale of Substitute products is a necessity, and ways must be found to make this a reality. I estimate nicotine electronic cigarettes sales in the past year (sold locally despite a ban in place) were equivalent to over 3 million cigarettes (not sold). Electronic cigarette vapour are not toxicant free, but are free of most smoke toxicants particularly of the leading carcinogen in cigarette smoke, 1,3 butadiene, and the leading cardiovascular toxicant, hydrogen cyanide. Importantly, e-cigarettes directly substitute for the habit as well as the nicotine, without the smoke. As persistent smokers face a one in two risk of dying early (they are on death row so to speak) they need a get out of jail card, and substitutes can provide it. To deny them such relief is inhumane and unconscionable. [Note: Dr Murray Laugesen is founder and managing director of Health New Zealand and Chair of End Smoking NZ. e-Cigarette News Roundup 11-16 - Who are you? Clive it’s a shame your article has allowed some of the most prominent anti tobacco propagandists to post comments which, to the casual visitor, make them appear scientific and scholarly. They are involved with organisations whose methods you clearly despise. I’ll repeat what I said earlier. The smoking ban was brought in on the back of passive smoking fraudulent science and lobbying carried out by these very people. Where were they when Sweden was prohibited from exporting snus within the EU back in 1992 and how many lung cancer deaths did that cause? Look at the 2010 Government consultation on ecigs and see which organisations wanted them taken off the market. Many smokers have now discovered a device, invented incidentally by a smoker, which enables them to continue something approximating the habit of smoking. They are now faced with a fresh barrage of lies and propaganda masquerading as science, as Public Health now seeks to encourage, for example, ecigs to be banned in work places, and uses casual racism (“they are made in China”) as Deborah Arnott did recently – how desperate is that? What do the trustees of ASH UK think about that? Better take your Panasonic Vieras down to the tip this weekend. It is no longer about protecting employees, but “denormalising” smoking and stopping the enjoyable consumption of nicotine. If they get their way and ANY regulation or tax is put on ecigs, they will be responsible for more lung cancer deaths, not to mention an enormous black market in untested and possibly dangerous liquid and devices. Public Health, you’ve got your smoking ban in all non residential buildings and secure mental hospitals. You’ve shut thousands of pubs and wrecked the social lives of hundreds of thousands and you’ve made barely any difference to the number of smokers. Ecigs do make a difference. They are not dangerous and even if they were, it won’t be any of your damn business. If a cafe says ecigs smoked here, then don’t work in it and don’t patronise it. Now shut up, go away, and find something useful to do. Jonathan – I’m not sure who you are referring to: most comments here support lower risk products and take a rigorous stance on the science. To get things done it’s sometimes necessary to work with people you mostly disagree with. The lobby lined up to kill off these products is pretty formidable, so I’d not be too choosy! It’s very heartening to see this important message supported by so many. I’m not an expert in the field with impressive credentials. However, the letter made me think about recent discussions on these issues I’ve had with fellow students on a public health course I’m on. My classmates are typically non-experts in tobacco, but smart, rational, well-meaning people interested in improving public health. It’s very interesting to me that most interested and intelligent non-tobacco-specialists I’ve spoken to swiftly reach the conclusion that the case for harm reduction in tobacco is pretty compelling and that actively withholding access to viable much less harmful alternatives to cigarettes is obviously ethically problematic. What would the rational external observer think, should the FCTC act to put roadblocks in the path of tobacco harm reduction? Thank you Clive for speaking up for a humane and rational approach. There is an ever-present risk in tobacco control debates of getting the science wrong, and hence getting the policy wrong too. This wouldn’t be the first time that has happened. Smokeless tobacco in Sweden has manifestly contributed to lowering tobacco harms in the population, but smokeless tobacco in India and elsewhere in Asia is part of the problem, not the solution. We need to be more nuanced in our thinking, respect the evidence, and not take simplistic positions which ultimately harm public health. If low risk smokeless products and products such as e-cigarettes are simply banned, the cigarette’s position is entrenched. Given that the problem with tobacco is not the drug, but the delivery system, that would be a tragic nonsense. Per Martin’s comment, smokeless tobacco products made/used in India appears to be significantly more hazardous than smokeless tobacco made/used in Scandanavia and the US, but its use is significantly less hazardous than smoking cigarettes or bidis daily. And when BAT test marketed snus in India a few years ago, the tobacco prohibitonists in India demonized and vehemently opposed the far less hazardous snus. Recently, many of these same prohibitionists have lobbied for laws to ban the sale of smokeless tobacco, while keeping far more hazardous cigarettes and bidis legal. Its a good thing that India’s smokeless tobacco sales bans (like other prohibition laws) are unenforcable, as strict enforcement would cause millions of smokeless tobacco users to switch to far more hazardous cigarettes and bidis. But of course, the prohibitionists who oppose harm reduction products and policies will always blame the “evil” tobacco industry for their own incompetence and arrogance. While the potential of low-toxicity nicotine products as harm reduction devices is as yet not resolved, the case favoring their use (and even their promotion for harm reduction) is at least as strong as, if not stronger than, the case against. I believe it would be a bad mistake for the COP to enshrine the negative position – opposing all nicotine-bearing products – in the FCTC. As Clive emphasizes, we need to keep our eyes on the prize: minimizing damage to health associated with nicotine and tobacco use, especially through cigarette smoking. A couple of the previous comments suggest a level of ignorance about what constitutes the danger in smoking that is very disappointing in this day and age. While nicotine is not necessarily harmless, in the doses at which humans self-administer nicotine it is not demonstrably very dangerous. The danger from tobacco use, and especially smoking, comes from the scores of other toxins, many carcinogens, that enter the human body through inhalation (or, in the case of some high-nitrosamine smokeless products, through oral tobacco use). The role of nicotine is to perpetuate exposure to these highly dangerous toxins by sustaining smoking addiction. If some smokers are incapable of kicking their nicotine addictions entirely (or, for that matter, simply unwilling), but they can satisfy that addiction with very low-toxin products, it would indeed be highly inappropriate to prohibit them from having access to those alternative products. It would also be counter-productive for the ultimate public health goal of tobacco control, which is to minimize damage to health. Excellent open letter, Clive – people might like to see Gerry’s take on this video and I should also say that we covered this letter on last night’s VT Talk – let’s hope that the COP does the right thing today. Many thanks to Clive for taking forward the debate about tobacco harm reduction, and for all those who have commented above. Great progress has been made in reducing the prevalence of smoking in some countries, but the continued rate of reduction in prevalence of smoking is not impressive. Declining prevalence in the west is more than offset by increasing prevalence in countries that are becoming more affluent. We need to be more ambitious. Most smokers want to stop smoking. Most have tried to quit. Only a small proportion of individual quit attempts succeed. What can we offer people who are unable or unwilling to quit using nicotine? Pure nicotine, does not pose a significant health risk. New nicotine delivery systems hold great promise for helping people to shift away from smoking. We need to disaggregate tobacco products and accept that there is a continuum of risk – with cigarettes way at the top end, and the newer nicotine delivery systems at the bottom. We then need policy options to help shift people away from the most toxic products. We also need pressure and incentives to encourage industry to develop a variety of safer nicotine delivery systems. It is a public health catastrophe that snus cannot be sold in the European Union except in Sweden. We should not repeat that catastrophe by introducing bans on e-cigarettes. Just read some of the comments above by people who have successfully quit smoking using e-cigarettes. Many of us could recount similar stories. Would FCTC want a ban that means that many of these people would revert back to smoking, and that many others would be denied a safer option to smoking? I’ve come across this a bit late but would like to add my name to this discussion. Although I am a member of TobReg and I received the submission to COP5, we were not invited to comment on it. The paper sent to COP 5 by the secretariat is five to ten years out of date. Thank you for this post, it is a breath of fresh air to see a logical approach to harm reduction be discussed. As a current user of the e-cig I can say if it had not been for this harm reduction method being available I would still be a full time smoker. Kicked a 23 year habit, and without the e-cig would have already had 3 relapses back to that habit full time without it. In my adventures I have found many sites filled with false information, and find to many things are blamed on the nicotine content and fail to take into consideration the effect of all the additional chemicals and the act of combustion with traditional smoking. As many of the withdrawals attributed to nicotine I had experienced, the only correct info I found relevant to my situation is the nicotine prevented the mood swings. I’ve now been on this for a year in January, gained 10 pounds that I can’t seem to lose. Got my smell back got my taste back and my energy back. Can pick the smokers out of a crowd by the smell now, yes I never thought I smelt that bad when I smoked..silly I know. I do agree with you banning harm reduction products does not accomplish the deserved goal and would definitely be perceived by many as supporting the traditional cigarettes. Logically how can you ban something less harmful and keep the known killer on the shelves of stores? In what world does that make sense? As for all the hype on the flavors, I don’t suppose they ever stopped to consider does an ex smoker current vapor with newly discovered taste buds still like the taste of cigarettes? In most cases not likely, I know I am not to keen to those flavors now. Nor do they consider the start up cost of e-cigs tend to be more expensive versus traditional smoking. The only regulation they should be concerned about is quality control and age restrictions. Thank you again for this refreshing read. Thanks, Clive, for your offering up your open letter. It represents a valuable effort to get attention paid to worthwhile perspectives that hold more promise than risk for public health—especially in a context in which cigarettes will be legal and available for the foreseeable future most everywhere. Thank you Mr. Clive Bates for your support of THR. I commend you for your time and efforts! Tobacco harm reduction is embraced by many thousands of us who came to realize that the normal quit smoking tactics were not working for us. Some amongst us, actually enjoyed smoking but chose tobacco harm reduction to lessen the risks to their health. In 2009, I tried an e-cigarette. I could not believe it could be so simple… Unfortunately supplies for my e-cigarette were curtailed by the FDA and I picked up smoking again for a time. On January 9, 2011 I once again picked up a e-cigarette. The e-cigarette performed better than the first one! I am now close to the two year mark without smoking, not a single puff even though I have lowered the amount of nicotine in the vapor. Thank you Clive for standing up for me. I smoked for 55 years, tried quitting many times with NRT’s and hypnotherapy. I was unable to successfully quit and during the process each time suffered both from withdrawal and the inability to focus on anything substantial. I could barely function at work. February 24, 2011 after doing a lot of research I started using e cigs. I have not had a tobacco cigarette since, I am able to function at work, my focus and attention span no longer suffer as they had before. I find it unconscionable that the pharmaceutical industry should be allowed to further undermine THR for profit. From the research I have done they are largely responsible for all the hate mongering by the alphabet soup agencies like ALA, ACS, CDC, FDA, WHO, and others whose acronyms I have forgotten. My tax dollars, in fact, are also being used by the DHHS, CDC and FDA to sponsor this radical consortium whose ideological and pathological hatred of anything that “looks like smoking” has supplanted any notion of rational THR programs. They run about buttonholing Health Officers of the states, counties and cities in the US and persuade them to enact banning legislation of e cigs in particular, for two reasons, “it looks like smoking” and it takes money away from the pharmaceutical companies, both in NRT’s and the down the road gold which is derived from the therapies for seriously ill and dying smokers. We have met the enemy and it is not tobacco, it is pharmaceuticals. The bans and/or extreme regulation of e cigs and other smokeless products will keep people enriching first tobacco and the government by virtue of the sin taxes, but in the end, and for the really BIG money, pharmaceutical firms. There are hundreds of thousands of us using e cigs in just the US. We deserve to be able to use these very efficient and satisfying devices rather than returning to the smoking of tobacco. We are not going to quit, we tried that and failed enough times to understand it just is not possible for some of us. Thanks for your reply to my comments, Clive. I totally agree with the thrust of what you are saying. I would be astounded if on any reasonable assumption it made sense to ban from the market products that are orders of magnitude safer than smoking, but working on the basis of the harm equation will force everyone involved to make explicit the estimates they are using and to have to justify them. I also agree that it must be for those who propose bans to make their case, given that they are denying smokers an option that might in some cases be their best hope of avoiding a horrible smoking-related death. Robert, I wish it was true that those advocating bans or marginalisation or smokeless tobacco or e-cigs were willing to “make explicit the estimates they are using and have to justify them.”. The list of decision-makers and advocates who are unwilling or unable to do this is long, and includes the European Commission, WHO, most health charities in Europe and the US, most European advocacy alliances, and the Framework Convention Alliance. In fact it is worse than it seems – few campaigning for the EU ban on snus even feel it is their responsibility to set out a case based on evidence, ethics and outcomes: hence the importance of clarity about where the ‘burden of proof’ should lie. An MEP has challenged lobbyists to provide evidence to support the EU ban on snus they are campaigning for, and I have asked them to make their case. So far nothing. Clive has raised extremely important issues and highlighted the need for policies to be based on cost-benefit analyses using the available evidence. Getting this wrong either way will lead to many thousands or even hundreds of thousands of unnecessary deaths. Given that smokeless tobacco and e-cigarettes are without question orders of magnitude safer than smoking the only possible reason for banning them is that they might a) be used as a gateway to smoking, b) add to the total number of nicotine/tobacco users without reducing the numbers smoking or the harm they incur from their smoking, or c) be used to keep people smoking who would otherwise have quit. The other option of treating them like currently licensed nicotine products needs to be analysed in similar fashion. Given the stakes, all of us in the field have a responsibility to work together to arrive at an unbiased assessment of the ‘harm equation’ resulting from different policy options. Where we disagree, we need to know if this is based on prejudice or different opinions about the nature of the evidence. Where it is the former we must be willing to accept that this is a luxury smokers cannot afford for us to have. Where it is the latter we need to work hard to come to the most accurate agreed analysis possible. Clive’s open letter should act as a stimulus for a collective approach to working out the harm equation of the different options relating to smokeless tobacco and e-cigarettes. This could take the form of a wiki. Robert – many thanks – very insightful. In particular, a good statement of some uncertainties, and, as always, you’ve given me cause to reflect and elaborate. 1. If an individual can substantially reduce their risk by using these products, we should not stand in the way of that choice – either by banning them, or by marginalisation through excessively restrictive regulation or misinformation in all its ugly forms. 2. We should accept there is risk that some individuals will inevitably take a path that causes the unintended effects a-c. However, we should recognise this as a tolerable risk unless it outweighs the benefits at population level. This is tolerable by comparison to the revealed societal risk appetite in this area – exemplified by the widespread availability of much more dangerous cigarettes. Further, it contains an element of choice and individual responsibility. We might hope that the number of individuals is small, but the fact that some make ‘bad choices’ should not be a reason to prevent others making choices that greatly benefit their health (as in 1. above). 3. If a ‘population’ level argument is to be made to support banning (or marginalising) these products, then the burden of proof lies squarely with those wishing to intervene to deny the individual choice to reduce their personal risk (as in 1.) above. I raise this point because I often hear demands for ‘proof’ that there will be no adverse population effects from these products – or variants on “yes, you’ve shown snus is enormously beneficial in Sweden, but you can’t prove it will do the same in [name country here]“. In reality the only convincing way to address the demands for this sort of evidence is to allow the product to be placed on the market and then see what happens (post-market surveillance). I think it would be hard to run a credible RCT or other trial to capture real-world behaviour. I think it is those seeking bans or marginalisation of much safer products that need to shoulder the burden of proof. Having said that, the further point is they have none: I know of no studies that support a case that a-c outweigh d-e for these or any reduced harm product (though I’ll willingly be corrected). Only then would we have reason to be talking about the kind of restrictions that some want to see in the EU and world wide, and even then, there remains a strong case never to deny individuals the option to use safer products. An excellent letter Clive, but I’d be shocked if it impacts the “quit or die” snus and e-cigarette prohibitionists who comprise many/most FCTC COP-5 delegates. Meanwhile, Philip Morris International endorses the FCTC protocol to reduce illicit tobacco. Not to be outdone, CDC tobacco harm reduction denialist Tim McAfee has falsely claimed that reducing cigarette consumption won’t reduce disease risks for smokers as he promotes the “quit or die” lie. Smoking fewer cigarettes is only a benefit if it’s a step to stopping smoking altogether, McAfee said. “Smoking fewer cigarettes is not a substitute for quitting,” he said. As the anti tobacco extremists continue to double down on their lies and counterproductive policies (that prevent smokers from quitting and reducing cigarette consumption), they increasing threaten the cedibility of the entire field of public health. It continues to amaze me how many people with scientific and/or medical degrees don’t know that nicotine does not cause smoking-related diseases. Smoke causes smoking-related diseases. I began researching smoking and nicotine back in 1990, looking for an answer to the question, “If quitting smoking is supposed to be healthy, why does it make me so sick?” I learned that nicotine enhances the ability to concentrate and pay attention, and improves mood, memory, and physical reaction time. That would explain why, in the absence of nicotine, so many smokers become confused, inattentive, depressed, anxious, irritable, forgetful, and clumsy. For a certain percent of smokers, these symptoms are temporary. But what about those who have an imbalance of neurotransmitters? Nicotine apparently has a corrective effect. Nicotine is being studied as a treatment for Alzheimer’s, ADHD, and other brain disorders. Research from 2003 reported that nicotine seems to diminish mental impairment stemming from stress or an underactive thyroid. It has been shown to prevent the build-up of alpha synuclein proteins in the brain that cause Parkinson’s disease. At an FDA hearing on long-term use of NRTs, Dr. Neal Benowitz, editor of Nicotine Safety and Toxicity, reported that the lack of increase in common cancers in lifelong smokeless tobacco (SLT) users indicates that nicotine is not a general cancer promoter (see Dr. Benowitz’ presentation). He also stated that recent Swedish studies and an NHANES study indicate minimal, if any, increased risk of cardiovascular disease with SLT use. And, of course, products that are not set on fire do not produce the smoke that causes lung diseases. SLT use during pregnancy does increase the risk of preterm delivery and preeclampsia slightly more than smoking does, but the reduction in birthweight among pregnant smokers is 190 g compared to 36 g for SLT. In a 2007 report, The Royal College of Physicians stated, “We demonstrate that smokers smoke predominantly for nicotine, that nicotine itself is not especially hazardous, and that if nicotine could be provided in a form that is acceptable and effective as a cigarette substitute, millions of lives could be saved” (see RCP report). In 2009, I stopped smoking after switching to an e-cigarette and, like thousands of other e-cigarette consumers, was appalled to learn that the FDA was doing its best to ban the products. We were outraged when we learned that the FDA, CDC, WHO, and many non-profit “charities” have been lying to us for years about health risks of smokeless tobacco products. That’s why we banded together to form the Consumer Advocates for Smoke-free Alternatives Association (CASAA.) Without smoke-free alternatives, we can assure you that we would still be inhaling smoke. Harm reduction strategies which allow smokers to substitute cigarettes with less hazardous sources of nicotine have the potential to prevent millions of avoidable deaths. Smokeless tobacco, and particularly snus, is hazardous but to a degree that is almost negligible in relation to cigarette smoke. New nicotine containing devices such as e-cigarettes have the potential to provide an even less hazardous, and more effective, substitute for tobacco smoke. It is important that nicotine products are regulated rationally, affording market freedom in inverse relation to their hazard, rather than the status quo, in which the most dangerous product is freely available but less hazardous alternatives are not. The Framework Convention should aim to enable the potential of harm reduction to be realised. While I strongly agree with everything in John Britton’s posting, his comments in a news article [linked removed at request of News-Medical site] advocate John Dalli’s Tobacco Products Directive for the EU, which would ban e-cigarettes according to a recent Lancet op/ed. The revised Directive was expected to tackle the industry’s once secret tactics to ensnare future generations of smokers. Specifically, it was expected to maintain the existing ban on all forms of smokeless tobacco (except Sweden, which had secured an opt out during its accession to the European Union to protect its domestic snus market), and extend the ban to e-cigarettes.7 These measures recognised concerns that the industry may seek to circumvent the danger that smokers, faced with indoor smoking bans, might quit.8 These products would help to ensure that consumers remained nicotine dependent. It is inconsistent to claim that e-cigarettes should remain legal, while simultanteously advocating a public policy that will ban e-cigarettes. Obama’s FDA has also made many false and misleading fear mongering claims about e-cigarettes ever since the agency illegally attempted to ban the sale of e-cigarettes back in 2009 through its web site. The FDA has also stated its intent to apply Chapter IX regulations of the FSPTCA to electronic cigarettes, but Section 910 of the FSPTCA would ban the sale of all e-cigarettes. In sum, I would urge everyone who claims to support tobacco harm reduction to stop advocating legislation, regulations, directives and FCTC protocols that sabotage or further impede tobacco harm reduction. I would hope that the Tobacco Products Directive could go out to consultation as soon as possible because we need to see what was proposed and be able to comment and maybe adapt it if there’s anything in there that could be improved. There are plenty of people who would be happy to see all low-risk nicotine/tobacco products banned or regulated into oblivion – I’d focus your fire-power on them. Then, Mr Britton, why did you put your name to an article calling for e-cigarettes (ENDS) to be regulated as medicines?? Thank you Clive for your willingness to stand up for me. As a smoker of cigarettes since I was 15 years old (I’ll turn 42 at the end of the year), I have recently “kicked the habit”. About a message nth ago my doctor urged me for the second time to try e-cigarettes. I looked into it a couple years ago and unfortunately fell victim to Internet sites that focused on unsubstantiated claims about the dangers of e-cigarettes and quickly dismissed the alternative to smoking. At the urging of my doctor I again decided to look into THR through the use of e-cigarettes. Having tried many of the medically prescribed tools for smoking cessation (gum, patches, inhalers, and drugs), I had literally given up on believing in could ever free myself from an addiction that may kill me and has resulted in essentially turning me into a social pariah. I am happy to say that I have gone nearly 3 weeks without a cigarette! The unbelievable part of this whole experience is that it was almost TOO EASY! And you know what? You can spend 5 minutes on a “vaping” forum and discover that there are thousands of other smokers just like me that have kicked the habit too!! Big Steel, the development of and the crucial effects on societies advancements during and after the industrial revolution era, resulting in our infrastructures. Electricity replaces kerosene for light and power, AC/DC who really invented it vs.who could afford to invest, underwrite and develop it? Thus, the financial wizard giants of the past who profited from patents that were overturned by coercion by huge dollar signs, the manipulation of the highest courts and politics of a democratic country, even though women’s voting rights had as yet been ratified. American Train co’s., replacing horse drawn carriages and the Pony Express, there were 100’s of independent rail companies bought out or forced out by monopoly giants. It’s history and there are parallels to THR across the board. Currently our pure genius historical curve this drive towards bold inventiveness, that is turning low income entrepreneurs albeit creative nicotine addicts into pseudo scientists. Perhaps just ordinary everyday voting citizens people, now DIYers, thrifty electronic technicians who are improving the flavor and operational workability of this THR tool for healthier breathing while eliminating diseases. Though addicted, and besieged by sin taxes, people are building and employing their own scientifically proven to be safer nicotine delivery products. A booming birthing has MA and PA small businesses by the thousands, developing unique improvements of the miraculous e-cigarettes on their own kitchen tables…or self made laboratories[(LOL) not really funny sic..one of ANTZ’ arguments]. An incredulous inventiveness on par with the Mother of Inventions that with every passing hour evolving the production of even more inspired electronic devices, new satisfying and alluring designs that can and have replaced coffin nails for millions of people… and in a failing economic era even dollars! When an exciting era of inventors and corporate backers were at war over money and power and still are! I think you raise some very important points. Around a billion people are addicted to nicotine in deadly cigarettes and many have no immediate plans to quit. Young people will also continue to try dangerous and addictive products. We believe it is preferable that, if people become addicted to cigarettes or decide to try tobacco, they can use a product that is markedly less harmful than cigarettes. In Sweden, primary use of snus is associated with reduced risk of cigarette smoking in adulthood. There is mounting epidemiological evidence indicating that the health risks from snus are MUCH less than from cigarettes. We should not delay in allowing snus to compete with cigarettes for market share, and we should be prepared to accurately inform smokers about the relative risks of cigarettes, snus, electronic cigarettes, and approved smoking-cessation medications. In light of all the available evidence, the banning or exaggerated opposition to snus and e-cigs in cigarette-rife environments is not sound public-health policy. Thank you, Clive, for bringing up these very important matters. I fully support the views that you are putting forward. Like you I have been concerned about the weaknesses of the background report FCTC/COP/5/12: Control and prevention of smokeless tobacco products. It generally ignores or marginalizes the potential public health benefits of some (but certainly not all) smokeless tobacco products. This orientation is partially reflected by quite strange selection of background material to present in the report. For example is it pointed out that a 1988 WHO Study Group Report contains a discussion of banning smokeless tobacco products. I was myself a member of that Study Group, but I would today be ashamed of referring to this “stone-age” document. Instead I have tried to draw attention to the enormous advancement of this field of science after 1988, so as was pointed out in the researchers’ letter to Addiction that was prompted by the weaknesses in the background report before COP4. Further, in the section on experiences with respect to SLT products the report is opting out the experiences from the only European country with real well established experience of long term wide-spread use of SLT, Sweden. A very striking overall picture of the Swedish experiences could have been picked up from the recent WHO report on mortality attributable to tobacco. It shows that the heavily SLT using male population of Sweden has lower level of mortality attributable to tobacco than males in ANY other European Union Member State. As far as SLT is concerned the health goals of the FCTC could most effectively be reached by a regulatory framework based on scientific evidence regarding actual health risk levels of different products. This would both protect consumers from the most seriously harmful products and give consumers access to products that can serve as effective smoking cessation aid. The WHO TobReg Report 2009 offers guidelines for making such an approach immediately feasible so as also pointed out in a recent article (Gray N, Borland R. Research Required for the Effective Implementation of the Framework Convention on Tobacco Control, Articles 9 and 10. Nicotine Tob Res. 2012 Sep 27). Thank you very much for taking the time to get your views togeter, which I wholeheartedly support. Harm reduction would make no sense if we could get away with drugs altogther. As is evident from the most powerful state US war on drugs has no success. And that is on illegal drugs. How could we possibly free us entirely of a legal cultural drug. The approval of marijuana by Colorado and state of Washington are clear signs that drugs are not going away. If one believes that tobacco/nicotine is here to stay, and nicotine is not a big health problem by the way, how can one not want the least harmful forms to be used. The point is even if you ban something completely, you still need a strategy for those that continue to use the product, because people behave not as you might wish or even as the law requires. Thanks for all you do to promote sound science and commonsense in preventing the horrendous toll of smoking. Why the WHO/FCTC feels the need to ban and strangulate in the cradle such techniques as e-cigs and reduced/modified risk nicotine-delivery such as smokeless and dissolvables, continues to elude me. They seem to have no compunction about lying and distorting the science and the facts to promote their fundamentalist ideology, no matter what the cost to addicted smokers and their desperate families, their widows and orphans. I do not believe the WHO, CDC, FDA, even the CTFK et al are evil or ignorant. So…why, i ask again? It can’t be loathing of the [20th century] evil tobacco co’s, as even they had nothing to do with the invention manufacture and initial marketing of ENDS. Well, no use in banging our heads against the wall–we must keep on keeping on. For more excellent commentary from Gil Ross, see The Deadly Crusade Against E-Cigarettes in The American Spectator. Prohibiting the safest form of nicotine delivery will increase, not stem, the calamity of cigarette-related death. Truly informing smokers about reduced-risk nicotine products, such as e-cigarettes and smokeless tobacco, and increasing access to these products is the best way we have to save millions of lives. Clive, I am in full agreement with your tobacco harm reduction message to members states & NGOs at COP V. THR is still the best kept secret in global public health and hundreds of millions lives could be saved if THR strategies, science and products were to be adopted. Even if the FCTC were to be fully implemented by all member states of WHO, we know that there will still be a billion smokers of combustible cigarettes by the year 2050 (WHO estimate). A yield of “quitters” of only about 200-300 million! Surely we can do better than this. As physician and NGO leader, I have been guilty of clinging to the “quit or die” message to patients and community for decades. This was due to a bona fide mistake – using the wrong comparator. In general, the global public health community has always defined the comparator / success in tobacco control as “complete tobacco cessation”. Why don’t we ask the question “in comparison with ongoing smoking of combustible tobacco”? This question would facilitate the development of more pragmatic, but still evidence-based and principles regulation. More important, it would give individual smokers the chance to quit, SWITCH to less harmful products or await disease and a premature death. Thank you for your timely and passionate call to us all. Bravo to you and to THR. This morning’s R5Live breakfast show featured ecigs at various points, as some workplaces in the UK are now banning them. The BMA spokeswoman, Vivienne Nathanson, came out with the usual anti ecig lies. The presenter, Nicky Campbell was sympathetic and actually tried one on air. I don’t see any level of taxation or regulation being successful. Thousands of smokers are still very angry about the lies behind the smoking ban. Ecig liquid and cigs are very transportable and very cheap. A years supply of 5.4% liquid, for mixing, amounts to 400ml. I have gone from smoking £21 of under the counter Golden Virginia a week (full price £36) to £7 of 2.4% eliquid. It can’t be taxed to any realistic degree without provoking an enormous black market; and the resulting liquid won’t be pharmaceutical grade, tested in independent laboratories, as it is is now. Cui bono? Why is the WHO trying to ban all smokeless products not belonging to the pharmaceutical giants? Puzzling, isn’t it? It clearly looks as if the health bureaucrats seek to create a worldwide smokeless nicotine monopoly for “Big Pharma”. The EU-tobaccodirective draft looked exactly the same – creating a pharmaceutical smokeless nicotine monopoly in the EU – until surprisingly last month the directive was stopped, because it was revealed that the health commissioner through a middleman had asked a Swedish smokeless-tobacco company to pay a huge bribe (60 mill €) if the company wanted the EU snus-ban lifted. I bring this forward because clearly, the EU-scandal was not a conspiracy by “Big Tobacco” as the public health establishment suggested. Rather everyone should ask with Roman statesman Cicero: cui bono? To whose benefit is a pharmaceutical smokeless monopoly? Are public health workers aware of how much money is at stake? The pharmaceutical giants have invested billions in lobbying and supporting the anti-tobacco movement through decades, in order to achieve smoking bans in public places and higher cigarette prices all over the world. The sales – and the prices – of their products have exploded. Do you really think they would give that up because of health issues? Of course not. This is not about health. It is about business. They cleverly maneuvered the tobacco war into the present Catch-22 situation, where their earnings satisfy their investors. You chose the wrong ally for the war. Now you are not fighting the tobacco industry any longer – that was an easy win. You are now fighting the pharmaceutical industry, which very likely will be a much bigger & much harder monster to get rid of. Vaping only Works because we can customize it. The over-regulation issue is just as bad as a ban. There has been recent hype over the possible threat to nicotine liquids, refillable cartridges, and a variety of battery types. This was mentioned in the VapourTrails TV interview with Gerry Stimson. There was mention that the Medicines and Healthcare products Regulatory Agency will in future only licence products that “consist of pre-filled cartomisers”, and that the ejuice that is normally bought today will “no longer be available”. This potential attack on people’s ability to purchase nicotine liquids and flavours in bulk, make up their own liquids, and use refillable cartridges, threatens the customisabilty and affordability of vaping, which has been the main attraction to the market. Gerry Stimson even said that the market “requires a variety of products to suit a number of needs and purposes”. Meanwhile, these same organisations that want to either ban or over regulate electronic cigarettes, completely neglect the dangers of pure nicotine being sold. No electronic cigarette user requires more than 100mg/mL (10%) nicotine solutions to make up their own liquids. Pure 100% nicotine liquids need to banned, as they are a serious danger both to the vaper and to others. 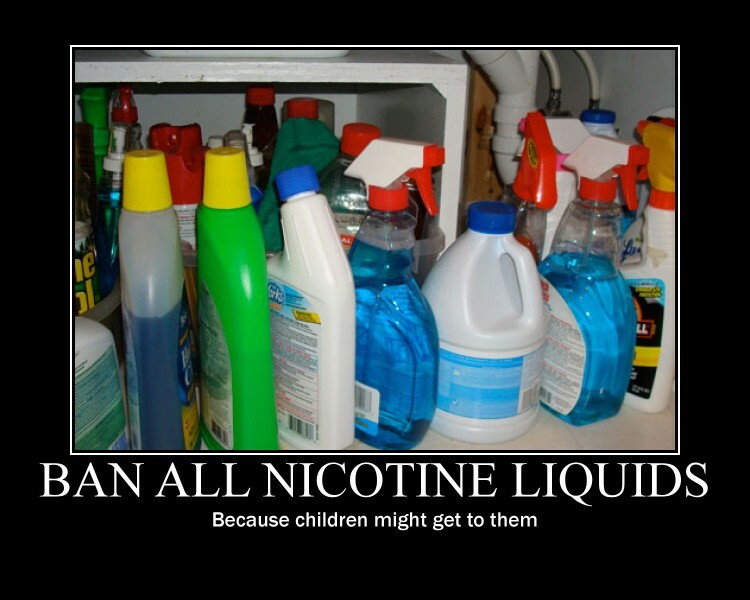 But the concept that nicotine liquids in general represent a danger to children is summed up nicely in this meme. * Promote the legalisation and availability of nicotine liquids at the concentration of 100mg/ml (10%) or below. * Promote the legalisation and availability of a variety of battery types and refillable cartridges. * Promote the safety and quality control testing of nicotine liquids, batteries and cartridges, and seek to enforce a ban on nicotine liquids above the concentration of 100mg/ml (10%). * Promote the legalisation of flavoured nicotine liquids at the concentration of 24mg/ml (2.4%) or below to be sold in supermarkets and convenient stores. * Promote the legalisation of batteries and refillable cartridges to be sold in supermarkets and convenient stores. Although I would take issue with your opening statement Clive, it is most commendable that you recognise the importance of the alternatives to cigarettes that are available, in particular the value of e-cigarettes to the lifetime cigarette smoker who wishes to stop using normal cigarettes for whatever reason, but doesn’t want to abandon the pleasures of smoking. The biggest problem we have is that the majority of the delegates you are addressing in your open letter are hardline zealots, for whom health has long ceased to be the motivation for their involvement (if indeed it ever was). I’ve read on several occasions variations of the statement “E-cigs should be banned because it looks like smoking“. This is a statement born of pure naked prejudice, and has absolutely nothing to do with the supposed caring for people’s health. I am occasionally active on an ex-pat forum based in Thailand, and a poster recently asked about smoking cessation drugs. I wrote an answering post suggesting that he eschew the potentially lethal drugs like Champix, and invest in a good quality e-cig. Imagine my astonishment when he replied that e-cigs are illegal in Thailand! This is the baleful influence of the FCTC for you. Harm reduction? Sorry Clive, much as I applaud your intervention, I’m afraid the anti-tobacco fanatics aren’t interested in harm reduction. They are wedded to the “quit or die” approach, and that dogmatism will see them fail in all they are trying to achieve. Not, unfortunately, before they have destroyed countless more thousands of lives however. But hey, that’s just collateral damage in the Righteous War. I don’t think the position is quite as bad as that… there are voices in public health that do share your view and mine (many have commented here), and many FCTC delegates who are quite thoughtful on these issues. Unfortunately, the FCTC meetings act a bit like an insular echo chamber, and those shouting loudest are often the ones least attached to the right science and ethics on this issue. An open letter that is not open reduces options, isn’t it? If e-cigs and smokeless tobacco are nicotine delivery why should be harm reduction? Is these paraphernalia to relief little quantities of nicotine? If yes, how much is less harmful? If it is less harmful it might however succeed to distribute nicotine to the nervous system, or not? The letter is open… anyone can read it from anywhere in the world, and anyone can comment on it, including people who disagree with it. In fact I encourage disagreement as it shows the quality of the opposing arguments. Very much agree. Recognizing that these products hold some potential for harm (if formulated or marketed inappropriately), the coferees could adopt language like that of the US law that gave FDA regulatory authority over tobacco. The language emphasizes that products need to be judged holistically based on their potential to improve population health. Except that the FSPTCA was drafted by CTFK, GSK/Pinney’s Mitch Zeller and Philip Morris lawyers to protect cigarettes from market competition by far less hazardous smokefree tobacco products, while the FDA’s attempted to ban e-cigarettes from 2009-2011 as agency officials (appointed by Obama) knowingly and intentionally deceived the public about the health/safety risk/benefit profile of e-cigarettes (to scare the public and to sway the views of federal judges considering the lawsuit). Now the FDA is planning to promulgate a “deeming” regulation to apply Chapter IX of the FSPTCA to e-cigarettes and other unregulated tobacco products. Unfortunately for public health, Section 910 of the FSPTCA will effectively ban e-cigarettes. The reports are chock-full of unsupported assertions against less harmful cigarette alternatives, while they ignore the growing body of evidence that THR is effective, especially given the public health community’s abject failure to address a fundamental tobacco control challenge: helping cigarette smokers quit. If the FCTC bureaucrats’ ideology goes unchecked, the result would be counterproductive worldwide government policies that harm those they should be helping, by leading to just one form of tobacco use: the most deadly. Cigarettes would still be the nicotine product of choice, and any nicotine product except historically ineffective medicinal forms would be banned. Parties to the FCTC should firmly reject these anti-science approaches and demand that the treaty remain bound to its original public health mandate. Really important that you have raised this and do support your main comments. During the development phase of the FCTC we were aware of the need to avoid “untoward” effects one of which was the potential for science to evolve and lead to reduced harm tobacco products. Early on we brought tobacco industry scientists into a WHO setting to hear about their progress and not to endorse their actions. That focus on harm reduction needs be explicitly supported again by WHO. I fully support this view, and note that Goldman Sachs has just released a report that details the risk to cigarette sales from electronic cigarettes. If Wall Street analysts are seeing this changed dynamic it is important that our community not be blind to it. A huge risk to the cigarette companies, and one that gets insufficient attention, is that they are selling an incredibly deadly nicotine delivery system at a time when there is overwhelming evidence that they could offer consumers a massively less harmful alternative. This has the potential to spur litigation and regulation that would have a very good chance of bankrupting Big Tobacco. Those companies cannot easily see off this risk on their own, and it would be a tragedy of epic proportions if our field gave them effective immunity by banning the far less harmful alternatives. David thanks… it is indeed a very timely paper from Goldman Sachs: E-Cigarettes: A disruptive innovation or a niche product? If E-cigs do take off, we see potential for a major shift in consumption towards E-cigs at the expense of conventional cigarettes. I’d first like to commend Clive Bates for posting this open letter on a subject that is of critical importance to health and welfare of millions of people, and to suggest that this presents an opportunity for expanding a civil dialogue on the subject. The stakes are high, the challenges daunting. But even more important are the opportunities. We should be careful not to throw the baby out with the bath water. Non-communicable diseases (NCDs) are on the rise. The number of deaths predicted from just the use of cigarettes is staggering. To confront these challenges will require the development of new thinking, new strategies, and a willingness to step outside the safety of our silos. New product development, new technologies, new innovations, competition and the need for a more uniform, rational approach to the regulation of all tobacco, nicotine and alternative products can, if implemented carefully and effectively, move us down a path that will one day see the deadly cigarette replaced with regulated consumer acceptable noncombustible alternatives. It is (especially in the developing world) shortsighted to think that we can wave a magic wand and ‘tobacco’ will disappear off the face of the earth. I also like to remind people that its not the tobacco or nicotine that causes the most significant harm to society but rather how that tobacco is grown, cured, processed, manufactured, and used that determines the risks and relative risks. Burn something and inhale it into the lungs and one can expect serious damage. Take it in a noncombustinble form (whether it is tobacco based or nicotine based) and the risks are signficantly reduced. NRT products for example use nicotine that is derived from the tobacco. Harm reduction should not be overlooked. The ultimate goal for a smoker is to stop using combustible products, the most deadly. Smokers should not be denied access to much safer alternatives, including long term use of pure nicotine. This would save many lives! Disclosure: I have no links to the tobacco industry. I am a consultant on tobacco dependence for the private and public sectors. Safer alternatives to nicotine are not e-cigarettes either smokeless tobacco. Those are safer than tobacco smoke but are nicotine delivery, a toxic and addictive product in the nervous system that modifies behavior. Tu ne le crois pas, n’est ce pas, Jaques? Stop the deadly quit or die message! Nicotine is addictive (but less than tobacco, and particularly when inhaled, but nicotine is not = to tobacco) but not toxic at the doses a smoker uses it. I recommend immediate cessation of consumption, and a visit to a counsellor – who will help you (for a stiff fee) modify your behaviour so that you eschew deadly beverages such and tea and coffee. A significant part of the evident success of ‘e-cigs’ is that it empowers smokers to quit cigarettes in their own way and in their own time (as I did). All that’s needed now is some light-touch regulation to ensure standards – and a willingness on the part of bureaucrats to leave well alone. I include in that category all those with a vested interest in maintaining the innefective (but profitable) medical/pharma solutions – and self-righteous pedants who don’t care how many deaths it takes to achieve their dubious and shallow ends. This has my full support. E-cigarettes should be left to evolve into an alternative to smoking as a consumer product. Overzealous regulation (let alone bans) will protect the market monopoly of the deadly conventional cigarettes. Public health strategists should view the growing interest in e-cigarettes among smokers as a grass-root harm reduction movement and a potential end-game of the tobacco epidemic.